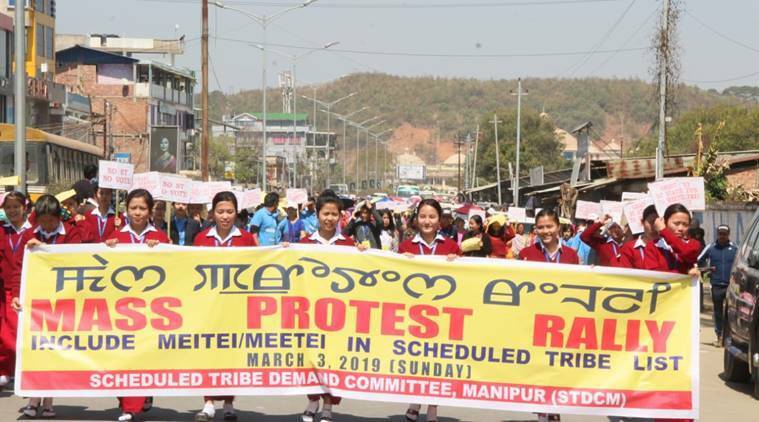 Intensifying its protest demanding inclusion of the Meetei/Meitei community in Scheduled Tribe list, the Scheduled Tribe Demand Committee of Manipur (STDCM) on Thursday called for a 30-hour strike in six districts from 6 pm of March 9 to March 10 midnight. The committee also warned that it would not allow the Manipur government to organise any event during the strike. STDCM convenor Laishram Romesh Meetei said the committee had proposed to go on a general strike if the government failed to send a recommendation to Ministry of Tribal Affairs for the inclusion of the community in the ST list by March 6. “The committee is left with no option but to impose the general strike due to the failure of the state government to come good on their assurance and act despite repeated appeals and dialogue,” he said. The STDC convener appealed to the people, including transport associations, women vendors, etc. to support the movement and to cease their normal activities during the general strike. The decision was adopted as one of the resolutions in a public meeting convened at Hapta Kangjeibung after the protest rally held earlier in March. The committee also demanded immediate implementation of Manipur Peoples Bill that mandates regulation of the entry of outsiders in the state. Meetei said the committee would not allow railway connection to reach Manipur unless ST status is conferred to the Meetei/Meitei community. He warned that the committee would stop construction work of Imphal-Jiribam railway line from March 11. Despite being the largest community in the state, the STDC claims the Meitei community are constantly under the threat of extinction without constitutional protection in the wake of the influx of illegal immigrants. The STDC has been spearheading a different form of agitation since 2014, demanding ST status for the community, which falls under the general category. On Monday, Manipur Chief Minister N Biren Singh on Monday informed the state assembly that the government was positively looking into the demand to include the Meitei community in the Scheduled Tribe (ST) list, terming it as “reasonable”. He also said initiatives would be implemented to safeguard the indigenous people of the state. However, the All Tribal Rights Protection Forum Manipur (ATRPFM) has come out strongly against the demand, stating that it would jeopardise the interests of the tribal communities of the state. It warned that tribal bodies would launch an intense protest if the state agreed to accord ST status to the majority Meetei\Meiteis.